For more than 20 years, Michael Eden has been a professional potter, often working in a traditional slipware technique. In 2006, he enrolled in a postgraduate program at the Royal College of Art in London and his career set off in a new direction. Now a self-described ‘maker,’ Eden explores how digital technology can be combined with traditional ceramic techniques to produce a new kind of work. 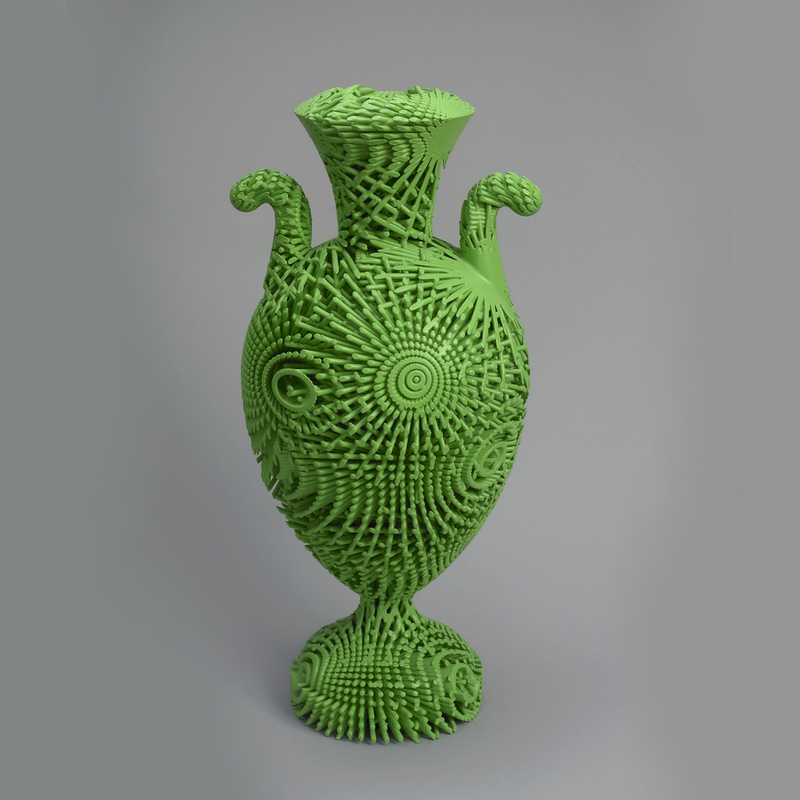 Using additive manufacturing, also known as 3D printing, Eden designs pieces inspired by historical ceramic forms, but the intricate structures of his creations could never be made on a potter’s wheel or with a mold. “The technology removes the constraints of ‘design for manufacture’ where the processing of the materials has an impact on the final outcome. In other words, there are only certain forms that I can throw on a wheel; gravity, centrifugal force, and the material qualities of clay limit the possibilities. [Tall Green] Bloom demonstrates the removal of these constraints and the potential I now have to create previously impossible forms that can creatively communicate ideas,” Eden said. Eden’s Tall Green Bloom Urn is a large, handled form that also references ancient classical ceramics, but is made in a truly twenty-first-century way. Eden designs the object using computer software, then sends the data to be “printed” in nylon. According to Eden, the form is “dyed to start with, as it would be impossible to access the interior surfaces with [a brush or] air gun without causing unsightly build-up of color” in the form’s many crevices and gaps. Eden suggests that the urn’s radiating rods, the layering of which forms the structure, are reminiscent of bursting thistles. This object will be on view in Saturated: The Allure and Science of Color beginning May 11. Nick Stagliano is a Curatorial Fellow in the Product Design and Decorative Arts department at Cooper Hewitt, Smithsonian Design Museum, and a first-year student in the History of Design and Curatorial Studies program offered jointly by Cooper Hewitt and Parsons School of Design. “Things machines have made…, Autobiographical Review by Michael Eden”, undated, unpaginated. Email from Michael Eden, April 16, 2018.